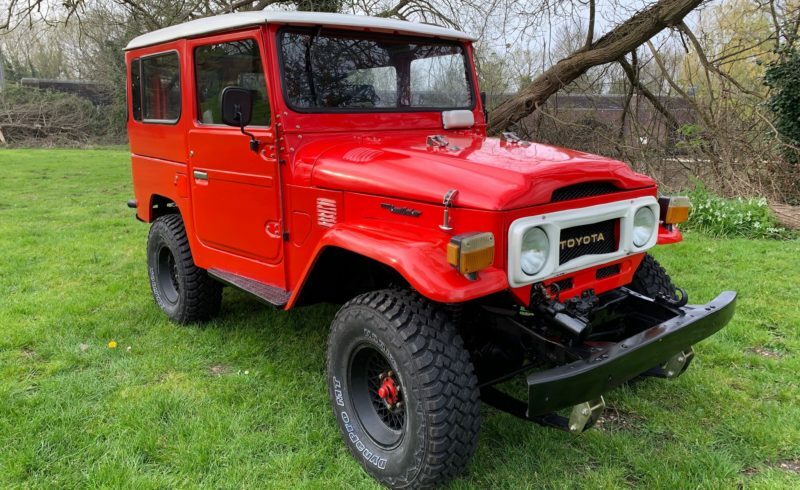 Here we have a beautiful 1970 FJ40 finished in the iconic “Freeborn Red” Still having its original engine and many original features, Note the engine cover has been replaced for a 2F Cam cover. The truck was completely restored 6 months ago, Body removed from the frame and both were extensively overhauled. The body and chassis are completely rust free. All the bushings were replaced and the leaf springs were refurbished too. During the restoration, all the body bolts holding the doors and windscreen have been replaced with Stainless steel bolts for longevity. Recent work includes: New Carb, New Battery, New fuel pump and a complete brake overhaul. Full service, including Oil and filter change, Radiator flushed and replaced with fresh coolant, new spark plugs and rotor arm. New window wiper motor, Upgraded Power steering. Interior has been re-trimmed MB TEX Faux Leather, the front seats have been upgraded to 80’s Toyota crown front seats for comfort and convenience. It still retains the original classic rear side facing bench seats which are always a crowd pleaser and very functional if you have to transport something in the back. Offered here at a very tempting price, this won’t hang around long.